The first thing to do is to get the Linux software and to write it on an SD card. We can do it actually before getting the Rasperry Pi board and material, and the day we receive it by post, the system could be running after 5 or 10 minutes of impatience! We will describe here how to do it on Windows and with a 4 Gbytes SD card which is about twice the size of the original distribution, allowing us to have sufficient space for more future applications and data. The Linux image file can be downloaded from http://www.raspberrypi.org/downloads and the Raspbian “wheezy” can be selected, for instance 2013-02-09-wheezy-raspbian.zip and then downloaded. The Zip file contains the image 2013-02-09-wheezy-raspbian.img. This is can be extracted and written on the SD card. We will describe here how to do it on Windows. 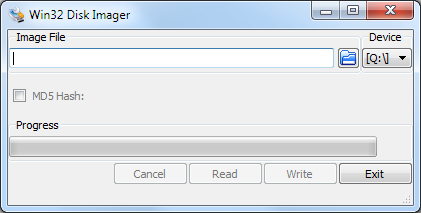 We see now that we need to specify the image file and the drive where a 2 Gbytes SD card has been inserted. Myself I use a cheap USB 3.0 multi card which is faster and particular interesting when transfering picture files from a camera. 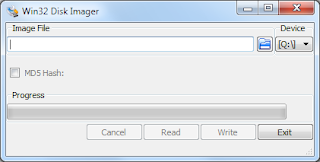 Using the Windows explorer, we can then decide to rename the CD card for instance to WHEEZYFEB13, to remember later what is on the card, und even to check the content to find out a number of files with the 09.02.2013 date, the creation date of this Raspian Linux. As usual, we should eject the SD card with the Windows gadget!